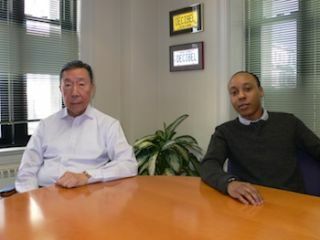 Fred Shen, left, and Alex Mayo, right. More and more I’m starting to view HDBaseT as a stop-gap solution to digital transport that will be replaced by a truly IP-based converged solution. So I’m looking to verify my thoughts, and if I’m correct, what is the roadmap for when we can start to see reliable IP-based digital AV distribution products available en masse, or are these systems already robust enough for us to specify and our reluctance is what is holding them back? AVB – In my two years within the AV industry, I’ve been hearing “this is the year for AVB.” In my opinion, 2014 is AVB’s last chance to get off the ground as a standard. Ceiling Microphone Arrays – Will a company debut a product that is less expensive than the ClearOne and open to use with other manufacturers’ DSP? Crestron and AMX – Will we see a robust offering of streaming products to replace their current HDBaseT lineups? Control Companies – Similar to the previous, if digital transport is now heading toward using an IP streaming solution, then that opens up the market to other manufacturers. Will this mean that Crestron and AMX go back to making control products their primary focus, or will someone else emerge as a hot new control company to provide an open third party solution? IoT – Does the AV industry recognize the “internet of things,” and how will that modify our design strategies now that nearly every device is networked? Enterprise Security – The other edge of the “everything connected” sword is how do we ensure that our design does not compromise the security of our clients’ networks. What are manufacturers doing from an engineering standpoint to ensure this security? Big Data and Control – With both Crestron and AMX spending a significant time last year to debut Fusion & RPM, what updates will we see to that this year? Bose – Last year, Bose had a prototype for a line array loudspeaker that was installed within a flat panel. I’m wondering if this technology will stay a concept case study, or start to see implementation in the real world. 4K – A real conversation about 4K. Who ACTUALLY needs it, why do they need it, and what solutions are available. Alex Mayo is an AV Consultant for Shen Milson & Wilke. Read our latest interview with Alex Mayo and Fred Shen.